Paul's photos: U8 Rat Run, older juniors Rat Runs, seniors outward, and seniors retun. Sunday 21st October 2012. The 21st Withins Skyline BM - 12km/300m from Penistone Hill Country Park, near Howarth, W Yorks (GR 025364). PM/NS Over 18. Records 41:28 Alistair Brownlee 2006, f 48:39 Jo Waites 2006. Cadbury's Curly Wurly to all finishers. Free coffee and biscuits. Sorry to say it folks, but it's Autumn on the way, and after a great summer of sport, let's see if anyone can break new Olympic Triathlon champion Alistair Brownlee's record for the Withins Skyline race set in 2006 at 41:28. Entry forms for the Auld Lang Syne race will available on the day, but remember there is NO ENTRY until 1st November 2012. 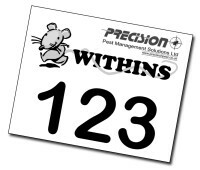 But on offer in the runners' free prize draw are 3 entries for the ALS race with race numbers 1, 2 and 3 available to the winners, you must be in the pub prize giving to win these race number prizes. We are taking a leaf out of the junior Rat Run races this year because we are introducing senior fancy dress prizes with the theme being Halloween of course. So is there any witches, horrors or monsters out there who fancy a run? U8 (over 6) 0.8km/30m; U10/12/14 1.6km/50m; U16 3.2km/100m. See the Quarry Runs page for records and a course map. It's Rat Run time kids so let's see you trying to follow in the foot steps of Olympic Triathlon champion Alistair Brownlee by winning a Quarry Run which he did in 2001. Don't worry too much if you're not on top form, remember when Jonathan Brownlee ran in the BU12 race he finished fourth and look at how he has become a world champion now. Prizes are extensive with at least the first three boys and first three girls in U8, U10, U12, U14 and U16 all having choice of the table, plus all prize winners will collect a toffee or chocolate apple including fancy dress. To end the day with even more fun don't forget the famous chocolate throw out.